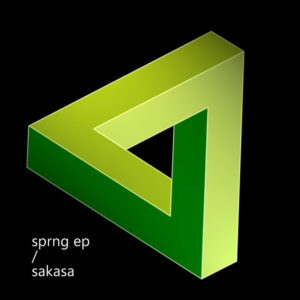 After nearly two years of silence, Nara producer Sakasa returns with the Sprng EP. And, if the past is anything to work off of, Sakasa might be offering a glimpse at the future — they were one of the first I remember this decade to make a whole album built around ’80s Japanese pop samples, and now that’s all over the place. Sprng sounds more metallic, at times more clattering (such as the opening number, accompanied by drilling details and an overall feeling of a computer freaking out on you), but with every discombobulated sound falling into just the right place. Samples appear on the faded “Sprng2” alongside a breakbeat, while “Sprng3” stutters about. Get it here, or listen below.